One example came up recently in our Newbury Street Press project on the Lippitt family of Rhode Island. The descendant, Mabelle Clifton Lippitt (1884–1926), is summarized above with her two husbands, with – at this point – my sources being birth, marriage, and death records from Rhode Island, Massachusetts, New York, and Illinois. The difficulty here came in determining the middle names of her second husband “Chester S.F. 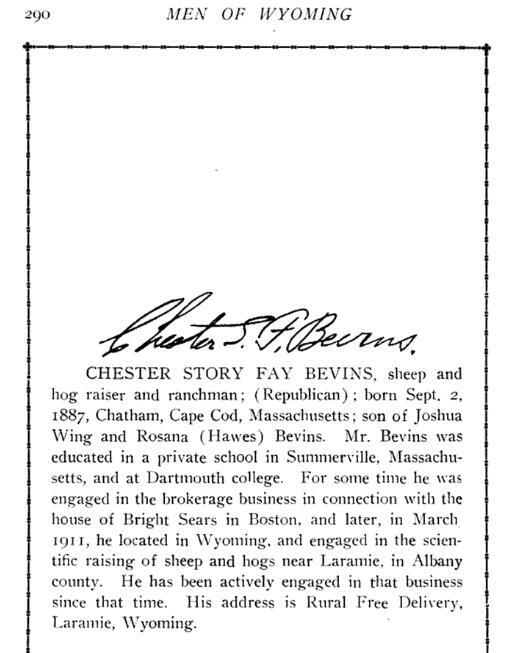 Bevins” and his father “Joshua W. Bevins.” Chester’s birth only gave his name as Chester F. Bevins. The initials “S.F.” are given on his marriage and death record. His mother’s middle name was given on her second marriage, yet his father’s middle name was not given on any vital records, including the birth and death of Joshua and Roseana’s other child. Joshua W. Bevins was the son of Elisha Mayo and Sophia (Wing) Bevins, this last a daughter of Joshua and Abigail (Freeman) Wing. At this point I made a guess that his name could be “Joshua Wing Bevins.” I then did a Google search for Joshua Wing Bevins. My second result was a book called Men of Wyoming from 1915. This work, written five years before Chester’s death, confirmed my guess for Joshua’s middle name and also provided Chester’s two middle names, about which I had not yet even made a guess, as well as more biographical information. Had I not made a guess on Joshua’s middle name (from a clue provided by his maternal grandfather’s name), I might not have found the above source in my search. I guess my advice would be “Be daring” in searching for the full name implied by middle initials – you might be surprised at your results! While Mabelle died in Wyoming, her death was also recorded in Rhode Island Vital Records. Conway P. Wing, A Historical and Genealogical Register of John Wing, of Sandwich, Mass., and his descendants, 1632-1888 (New York: The De Vinne Press, 1888), 172, 276 (which incorrectly lists Joshua as John). Joshua W. Bevins and his twin brother Benjamin were born at Brewster, Mass., 6 Dec. 1858 (Brewster Vital Records, 1852–1936, 8). 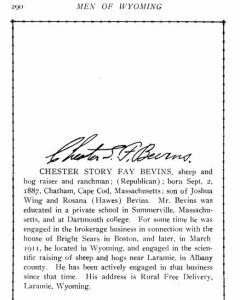 Am I reading this wrong, or is Chester Story Fay Bevins actually a “daughter” of Joshua Wing and Roseana Nickerson (Howes) Bevins?? There’s a comma, not a semicolon so it looks that way. Thanks Donna. Yes that is an error on the image, which should say “son” and not daughter. I have fixed this in the overall manuscript! How well I know this “Problem,” supposedly my Dad was named for his Father, thus making him a Jr. He thought his middle name was Martin, but his Aunt, younger sister of my Grandfather, has him down in her notes as Monroe. In their day children were often named after Presidents. My Dad had a brother named for Benjamin Harrison with their last name. There is no Vital Record of any kind with the middle name of either of them with the full middle name, but the middle initial “M,” is used for both my Grandfather and Dad faithfully. Have looked at School Census, Wills, no Birth Certificates were filed for either one, both born well before they were required. Death Certificates, Military information, Social Security, are no help either. My Dad was for a short time after his Mother died sent to school in an Orphanage, nothing found. No record with other than the “M” is found except for that Aunt’s notes. I’m going with her or else he really wasn’t a Jr. and they gave him Martin for a middle name as Dad himself thought. Announcements were not sent out in his day like we do now, nothing in the newspaper except that a son was born to my Grandparents..
My grandfather’s first and middle names were Charles Foster. When their eldest son was born, they wanted to name him after his father, but didn’t want a junior, so they named him Charles Francis. This, in retrospect, caused decades of problems, as they were both Charles F. but no junior to distinguish them. My uncle finally resolved the confusion by using C. Francis. A similar problem occurred with some Quebec immigrants to New England. Baptismal names were chosen with various saints in mind, not always what the children wished to be called when entering American life! My grandfather was baptized Valerian Adonai, which was reversed and anglicized as “Dennis V.” in writing and “Dennie” as spoken. We all have to keep “pulling at threads” to arrive at definitive information, especially concerning names. My husbands 8th great grandfather is John Alden. My Father in law is George Alden Trowbridge Kinsman.. 3 wonderful families in New England History. I’m a little late on this comment, I realize. My gg grandfather, known in virtually all vital records as N.S. Bastion, b. 11 June 1808, in Canajoharie, Montgomery Co, NY (according to his own and his father’s Bible records), d 23 Feb 1884, Fowler, Adams Co, IL (according to two newspaper articles and his death certificate). He became a Methodist minister, and that denomination kept great records. N.S. Bastion is the only name they knew him by. But his mother, Neeltje (or Nellie or Eleanor in baptisms of other children) Schermerhorn, whose Dutch New Testament I have, had him in her list of children as Nicholas Schermerhorn H. Bastion. Now what did that “H” stand for? I’ve never seen the “H” in any other record, and I have a lot of documents, many in his own handwriting. But there is one good clue. As long as the family lived in New York, in the Schenectady/Albany area, to judge by where their 8 children were baptized, N.S.’s father went by Hendrick. When they moved to southern Indiana in 1821, he switched to Henry. So until I find a better candidate for that “H,” which my gg grandfather seems never to have used, I’m going to assume that his mother honored her husband by giving his initial to her third child. It made a very long name, so whether in her mind it was the initial only, or the full Hendrick, I don’t imagine I’ll ever know.